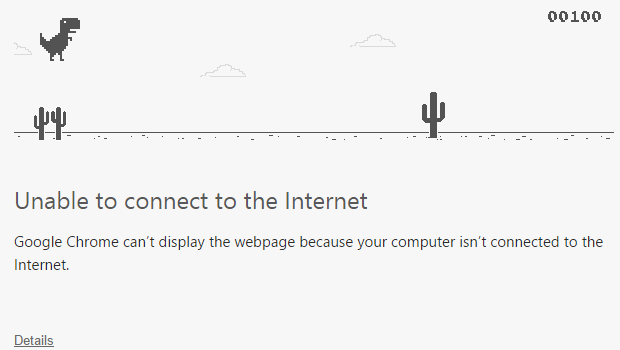 Google has added an endless runner game into Chrome Canary, in which you attempt to survive as a cute T-Rex dinosaur by jumping over cacti. The game is only accessible when the browser detects you’re offline, on the ‘Unable to connect to the Internet’ error page. It’s completely hidden unless you know where to look. The new error page was first spotted by Google open-source Chromium evangelist François Beaufort. In his Google+ post, however, he doesn’t reveal anything, likely because it’s meant to be an easter egg. The game will track your progress with a high score count, including pings of celebration upon every 100 points you make. Unfortunately, your score will disappear after you refresh the page, but hopefully you’ll be reconnected by that point. Adding a basic, but by no means partial, game to an otherwise complex application reminds me of the early days of μTorrent. At one point, the developer decided to add Tetris to the about page of the software, which at the time was still the smallest BitTorrent client available. The endless running game is a classic genre, one that has been recently revived on mobile devices. Google may have brought it over to the desktop first, but we wouldn’t be surprised if the goal was to have it work across all versions of Chrome, including on Android and iOS. Google describes Canary as “the most bleeding-edge official version of Chrome and somewhat of a mix between Chrome dev and the Chromium snapshot builds.” It’s currently on version 39, which the stable channel will likely see before the end of the year.